Enjoy some of the community’s finest talent at Southland Mall! Join us for Festive Fridays every week at Southland Mall. 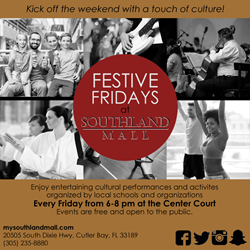 Join us for Festive Fridays every week at Southland Mall where retail meets culture. Southland Mall presents an eclectic mix of entertainers in the month of May for their cultural “Festive Friday” event series, showcasing the talents of local musicians, dancers and artists. Every Friday evening, shoppers are invited to enjoy live entertainment and interactive activities alongside family and friends at the “Festive Fridays” stage, located in the mall’s Center Court from 6:00 p.m. to 8:00 p.m.
May 6th – The students of Genesis Ju-Jitsu bring their skills to the stage of “Festive Fridays” to show off their most creative martial arts moves! May 13th – Performers from Hipnotic Dance Studio will showcase their latest in belly dancing, gymnastics, ballet, salsa and hip-hop, gracing the stage to show the audience their best moves. May 20th – Alexander Montessori School takes over “Festive Fridays” to show off their talented voices. This special “Festive Fridays” will include a performance as well as an award ceremony that will introduce you to their top performers. “Festive Fridays” is a free event series open to the public. Southland Mall is conveniently located on U.S. 1 and S.W. 205th Street, off the Florida Turnpike, Exits 11 or 12. For more information on Southland Mall or to learn about partnership opportunities for future “Festive Fridays,” please mail inquiries to info(at)bristolpr(dot)com. Southland Mall, located in South Miami-Dade County, Florida, the densest, most populous county in the southeastern portion of the state of Florida, has over 1 million square feet of gross leasable area. Southland Mall is conveniently located on U.S. 1 and SW 205th Street, off the Florida Turnpike, Exits 11 or 12, and is the only enclosed regional mall servicing South Miami-Dade County down to the Florida Keys. Southland houses over 100 specialty stores, including Macy’s, Sears, JC Penney, TJ Maxx, Old Navy, Starbucks, a 16-Plex Regal Cinema and diverse Food Court. For more information about Southland Mall, visit mysouthlandmall.com on your mobile device, follow us on Twitter @solandmall, ‘Like’ us on Facebook at southlandmallmiami, or call (305) 235-8880.